For a film with such an unfussy title, The Reptile is in absolutely no hurry to reveal what its zoological moniker actually means. We're clued in to the fact that there's something nasty at large in an unnamed Cornish village even before the opening titles, when it attacks and kills a man named Charles Spalding. "Who is it this time?" pub landlord Tom asks a cheerful but jittery fellow known locally as Mad Peter (John Laurie, warming up for his role as Frasier in Dad's Army), tipping us off that this is far from the first such mysterious death. And Tom is convinced it won't be the last. A short while later, Harry Spalding (Ray Barrett) arrives to inherit his late brother's house with his pretty young wife Valerie (Jennifer Daniel) in tow. The locals are a less than welcoming bunch who file out of the pub almost as soon as Harry enters. When Harry and Valerie return to their new home the interior has been ransacked, and after tidying things up Harry makes his way back to the boozer to find out who was responsible. The locals assure him it wasn't their doing and promptly walk out again. "They don't like strangers in these parts," Tom assures him, but as an ex-navy man he's not so easily fazed. He takes a cautious liking to Harry, who's not convinced by the official report that his brother died of heart failure. Harry's on his way home when he's set upon by Mad Peter, and once he's calmed the man down he invites him back for dinner in the hope he'll reveal what he knows about the night that Charles died. Peter eats and departs without saying that much, and a short while later is seriously wounded by an unseen assailant. 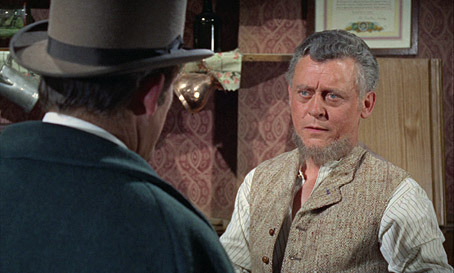 He makes his way back to the Spalding house and Harry goes off in search of medical help from the sternly unfriendly Doctor Franklyn, whom Valerie met earlier when he turned up at the house in search of his daughter. The only problem is that he's a doctor of theology, so not much use when it comes to medical matters. Unless it comes to reading the last rites, I guess. He accompanies Harry anyway, but by the time they reach Mad Peter he's died of his injuries. Following Peter's sparsely attended funeral, Harry hangs out with Tom, and Valerie returns home to find Franklyn's daughter Anna (the divine Jacqueline Pearce) is arranging a small welcome by decorating the house with flowers. The two hit it off, but when Anna is rattled by a Malayan man she finds skulking outside she makes moves to leave, which is precisely when dad shows up to angrily scold her for leaving the house without permission. But Anna has invited the Spaldings for dinner the following evening, an offer that Franklyn would clearly never have made himself but is too much of a gentlemen to rescind. Up until this point, the story has unfolded as a string of intriguing but non-specific hints at what lies at the heart of the village's malady. The questions pile up but no clear answers are immediately forthcoming, building a seductive sense that dark secrets are being kept and that exposing them carries risks that no sensible man would be willing to take. The mystery deepens when the Spaldings turn up for their dinner appointment and Anna shows Valerie her collection of animals, which are lined up in cages like subjects for unspecified medical experiments. But that's not the end of it. After dinner, Franklyn encourages Anna to play the sitar, at which she is very skilled (director John Gilling makes smart use of camera angles and movements here to disguise the fact that Pearce herself is not playing). 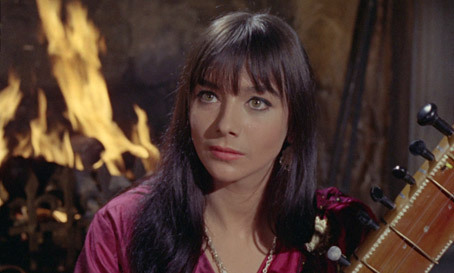 This leads to one of the film's most extraordinary sequences, when the shadowy appearance of the aforementioned Malay man prompts Anna to alter the tone of her playing and stare at her father with a look of sexually charged defiance, prompting him to completely lose his rag and smash the sitar furiously against the wall. It's to the film's real credit that no explanations are forthcoming and we're left to interpret the back story ourselves. We're an hour into the ninety-minute run time before that title is explained in an attack that leaves Harry fighting for his life, temporarily neutering him as the story's would-be hero. Fortunately for all, the level-headed Tom is on hand to help, which he does in his own quietly effective way, protectively deceiving Franklyn about Harry's condition and drugging the Spaldings' cocoa to prevent them from placing themselves in more danger. And we know his intentions are honourable thanks to a top-of-form performance from Hammer regular Michael Ripper, who is here is a model of integrity and restraint and absolutely the man you would want by your side in a crisis. So likeable is Tom that on two occasions where he seemed to be targeted for doom I became disproportionately delighted by screenwriter Anthony Hinds' refusal to pander to generic convention. And despite solid work from lead players Ray Barrett and Jennifer Daniel, it's the supporting cast that shine brightest here, from Noel Willman's persecuted Dr. Franklyn to the lovely Jacqueline's captivating, sadness-tinged turn as his daughter Anna. Like the voodoo in Gilling's excellent companion film, Plague of the Zombies, the hold exercised by the Malay over Franklyn and his daughter is rooted in a time when audiences could still be frightened by things that were too foreign. But at least he is played by a Calcutta-born actor rather than a blacked-up Brit, and the inference is that Franklyn's woes stem largely from his own ill-considered misadventures when travelling in the East. It helps immeasurably that Gilling sidesteps any hint of camp and allows actor Marne Maitland to intimidate on the basis of the hold he seems to exert rather than anything he actually does. If the method employed to finally defeat the monster feels a tad anti-climactic (if scientifically sound), then compensation aplenty is provided by sequences set in the slightly over-lit but still oddly unsettling reptile's lair and an interior fire that really does look to be dangerously out of control. And despite the air of restraint and monster make-up that, while neatly designed, doesn't really stand up to intricate scrutiny, The Reptile still delivers on disturbing horror, never more so than in the green foam and neck wound on Harry's late brother (this really is yucky for a film of this vintage), and in the thing that Franklyn finds lying on his daughter's bed. I shall say no more. As with the simultaneous StudioCanal release of Plague of the Zombies, this is lovely restoration that really does exceed expectations. The warm palette is typical of Hammer films of the period but still vibrant when the pastel colours give way to primes, and the contrast is close to perfect, providing solid blacks without loss of picture information in shadow or on darker surfaces. The level of detail is consistently excellent, particularly evident in hair facial detail, the texture and patterns of clothing, and in Bernard Robinson's richly busy production design. As with previous releases in this series, there's hardly a dust spot to be seen and no trace of any former damage. Even the day-for-night footage has been nicely graded here. This is how all Hammer films should look. The framing is the original 1.66:1. The linear PCM 48 mono track does show its age a little in the inevitable range restrictions, treble bias and lack of bass, and there is some audible background hiss at times. But for its age this is a solid job, clearly reproducing dialogue, effects and music and displaying no obvious damage. A retrospective making-of documentary in the mould of the one on the Plague of the Zombies disc and featuring many of the same faces, including Hammer Films historian Marcus Hearne, actor, writer and horror fan Mark Gatiss, genre writer Jonathan Rigby, and the film's art director Don Mingaye. David Huckvale once again deconstructs Don Banks' music score, and Pinewood's technical restoration manager Jon Mann talks about reconstructing the film to its present lovely condition. All fine stuff, but why no chat with Jacqueline? Another collection of Hammer film extracts with horrible theme music and an Oliver Reed narration. Titles covered include Countess Dracula, Dr. Jekyll and Sister Hyde, Stolen Face, The Nanny, The Anniversary, Black Widow, The Witches and Fanatic. Once again, the pre-restoration image is washed out and over-bright, but you can still make out some of the damage that's been repaired. A niftily assembled piece that wisely only provides a brief glimpse of the title creature. 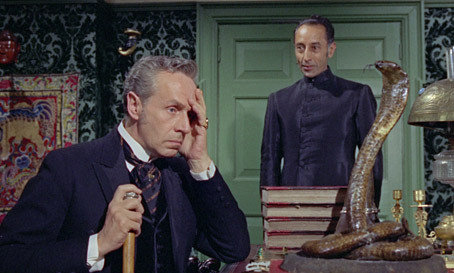 While not quite as special as it's companion piece, Plague of the Zombies, Anthony Hinds' script, Gilling's direction, fine performances from Michael Ripper and Jacqueline Pearce, an intriguing build-up and some splendid horror moments still mark The Reptile as one of Hammer's best films. Another superb restoration and solid supporting extras make it a must–have for Hammer aficionados, and if you bought Plague of the Zombies then you should have this too.